Use MJK Ultrasonic sensors with MJK Shuttle level transmitters, flow converters and pump controllers. The sensors is in moulded housing. 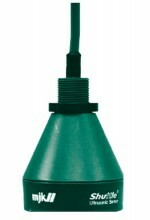 The sensor is constructed with a 1" thread, for easy mounting. The Ultrasonic sensor has a moulded piezo-electrical crystal which emits the ultrasonic pulse and receives the echo signal from the surface to be measured. For measurements specifications of the sensors click on the drawing. Click the button below to add the Ultrasonic Water Level Sensors to your wish list.